Back to Boyhood, though. It’s beautiful, I laughed a few times and wept exponentially more times. My drive home was melancholic, I stopped at Trader Joe’s on the way to pick up groceries. I made the mistake of getting behind a woman who had much more in her basket than I thought and I kept thinking, how is it that, no matter what, I always pick the wrong line at the grocery store? I pulled out my phone to check my Facebook, the first thing I read was my friend Alan asking if Robin Williams’ death was a hoax or not. The first I’d heard of it, I scrolled through my news feed and quickly deduced that it was not a hoax. “I know he had some health problems,” she innocently offered. “It’s really sad,” I said. “They say it’s a suicide,” the guy behind me, phone in hand, offered. Better for you to tell her than me, I thought. From the look on her face when I first told her, I seriously thought she might have been related to him. “This is so sad,” she said. We all agreed. She asked if I needed validation, I told her I did, she validated my parking and the three of us said goodbye as I walked away, headed for my car. I thought about The Fisher King and Dead Poets Society as I drove home, pondered how one could probably not have played those roles if one did not understand something about sadness. There was always something sad behind the twinkle of those eyes. I do not remember when my Facebook feed has been so filled with people telling their just passed celebrity stories. This feels different from Phillip Seymour Hoffman or Michael Jackson or Whitney Houston, not worse, necessarily, but different. 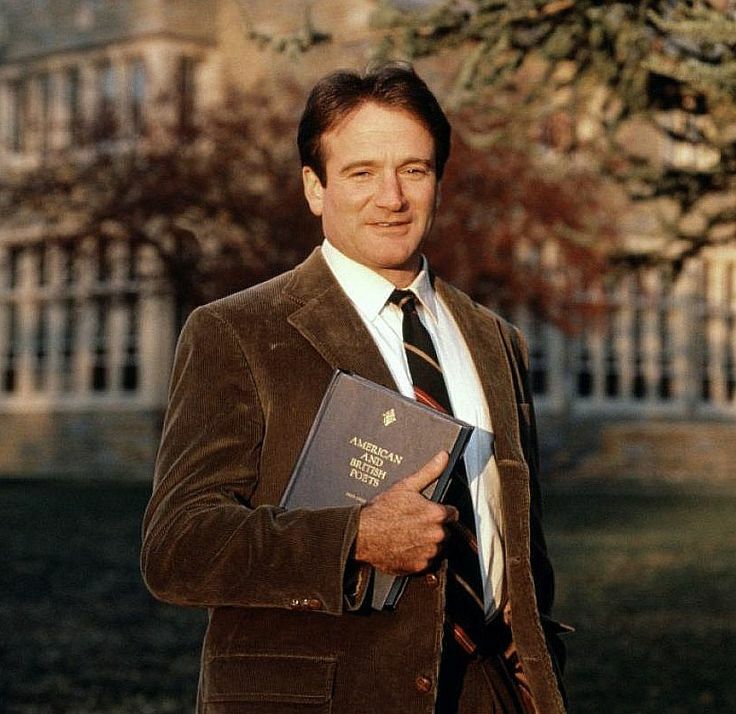 I can’t in this moment put my finger on it, but I think it has something to do with the nurturing teacher he played in Dead Poets Society, a movie that I remember watching over and over again when I was a budding youth minister. When I was a youth minister, I made my kids watch the movie, I seem to remember making them all stand on their chairs and shout, “O Captain, my captain.” I did and do want them to carpe diem, to seize the day. When I was watching Boyhood today, I thought about all the big ideas I had when I was the age of the films protagonist. Now my wishes are so much simpler: family, friends, pets, enough money, a little travel, a really good book, the chance to explore some layer of my creativity, joy. For the most part, I do understand that Robin Williams was not Garp or Mork or Mrs. Doubtfire or John Keating, but there was something of him, undoubtedly, in every character he played. Maybe the manner in which he died will forever color or carry a tenderness to the way we remember him, I don’t know. Tonight, I watched YouTube clips from Dead Poets Society. I started to post the one where John Keating tells his students to make their lives extraordinary, a sermon of sorts. Then I watched the clip of the end, where all the students stand on their chairs, saying farewell with final “O Captain, my captains.” But then I found this, the one I’ve posted, the scene where Ethan’s Todd Anderson makes his first connection to what he’s been studying and what he has stewing within him. And Robin Williams is at his best, his sad eyes twinkling with pride that his student finally sees something in himself that he’d seen all along. Maybe this is so sad for us because he had this something special, this rare grace that enabled him to reach through the celluloid and place his furry hand on our own sweaty, pimply foreheads and persist and cajole and encourage until we realized that we, too, all of us, were poets as well. There is something different, something less expected, more shocking, more disturbing, sadder about Robin’s death. There is something that touches deeply. Imagine a world without Corporate Celebrity, if you can. Or an imagination not gummed up with that horrible notion that people should “seize the day.” Or imagine both. “Work with steady purpose” is much better advice generally.